See our Fall 2018 course offerings through viewing the weekly schedule on the left (click on the link below the schedule to download a PDF) and review the course descriptions below by clicking on the course number tabs. If you are new to Maitripa College and are wondering if a course or degree program is right for you, please contact us at [email protected]. PHL303: Madhyamaka Philosophy: Where is the Middle Way? This course is the first of the “service pillar” at Maitripa College, the totality of which spans an introduction to the developing field of “Buddhist Ministry” (a term with many definitions at present, but broadly considered to be the field of introducing people to paths of service informed by their Buddhist practice) and an exposure to some of the conversations and practices alive in this field. This course also embodies a culturally-based orientation to the unique environment of Maitripa College, our history and lineage, and the contemplative education and pedagogy that we rely on at Maitripa College, as well as beginning the work of personal theology through narrative. Open to admitted degree program students only. This course will provide a broad-based survey of the history of Buddhism in India and Tibet. We will begin by discussing the historical and cultural context out of which Buddhism emerged. From here we will discuss the brahmana (ascetic) movement, the life the historical Buddha, and the formulation of the early sangha. After discussing Buddhism during the lifetime of the Buddha, we will cover the early history of Buddhism including the early Buddhist councils, the creation of the Buddhist canon, and the formulation of early Buddhist schools. We will then cover the beginnings of the Mahayana, the early Mahayana philosophers and the intellectual history of Mahayana Buddhism in India. In addition to reading histories of Buddhism, we will also read and discuss scholarly articles about the proper methods for approaching and understanding this history. We will then turn our attention to the transmission of Buddhism from India to Tibet. We will discuss the key figures in both the early and later disseminations of Buddhism to Tibet and the key events which helped shape the forms Tibetan Buddhism takes today. Each of the four major Tibetan Buddhist schools as well as the indigenous Bon tradition, their histories, key figures, texts and lineages will be discussed. Students will gain a detailed understanding of the religious and intellectual history of Buddhism in Tibet, including the key figures, lineages, texts, and practices which make the schools of Buddhism in Tibet unique. This course will provide a broad introduction to the vast corpus of techniques and practices of Buddhist meditation, with particular emphasis on the techniques of analytical meditation. The course will be taught in an interactive format, allowing students the opportunity to learn specific meditations as directed by the instructor, practice them, and discuss their experiences in class. The subject matter will parallel the topics of Buddhist philosophy as taught in PHL301 | PHL301d. Part of this class will include regular meditation sessions out of class, the keeping of a sitting journal, and the opportunity for objective discussion on the effect of these practices on the individual’s mind. If desired, the committed student will have the opportunity to work with the instructor to design a personal meditation practice. 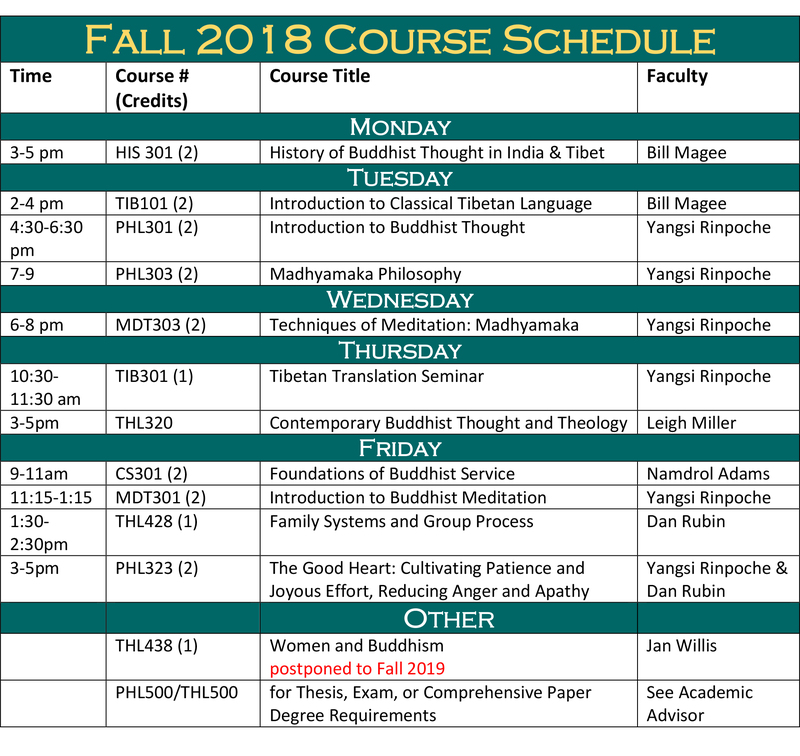 The subject matter of this course will parallel the topics of Buddhist philosophy as taught in as taught in PHL303 | PHL303d. The course will be taught in an interactive format, allowing students the opportunity to learn specific meditations as directed by the instructor, practice them, and discuss their experiences in class. Part of this class will include regular meditation sessions out of class, the keeping of a sitting journal, and the opportunity for objective discussion on the effect of these practices on the individual’s mind. If desired, the committed student will have the opportunity to work with the instructor to design a personal meditation practice. This class will make use of philosophical treatises, literature, and historical analysis to present the foundations of Buddhist philosophy as taught by the early Indian pandits and commented upon by Tibetan scholars. Readings will include selections from the Abhidharma Kosha, Pramanavarttika, and Abhisamayalamkara, with particular focus on the readings that relate to the three scopes of the lamrim as presented by the Tibetan scholar Je Tsongkhapa. Students will come away from this course with a foundation in Buddhist philosophy and knowledge of key issues of Buddhist Studies, including personal identity and the five skandhas, subtle impermanence, and the basics of a Buddhist world view. Students will gain important grounding in basic principles of dependent arising, the structure of Buddhist logic, and familiarity with Buddhist logic and logical arguments. An overview and in-depth introduction to the heart of the Tibetan Buddhist tradition, the philosophy and practice of Madhyamaka, or the “Middle Way” as presented by the renowned Indian Buddhist philosopher Nagarjuna and his Indian and Tibetan commentators. Primary readings for this course include Lama Tsongkhapa’s Essence of Eloquence (Lekshe Nyingpo) and its sources. Students are strongly encouraged to enroll in MDT303 Techniques of Meditation: Madhyamaka in conjunction with this class. This course will examine the cultivation of patience as an antidote to anger, and joyous effort as an antidote to apathy, discouragement, or indifference from both traditional Indo-Tibetan Buddhist and western psychological perspectives. Specific attention will be focused on the analytic thoughts and meditations, worldviews, research, and secular techniques said to reduce anger and apathy and increase patience and joyful effort in daily living. The Buddhist perspective will be examined through a close reading of two chapters from the sixth century Indian mater Shantideva’s timeless classic, the Guide to the Bodhisattva’s Way of Life, a beloved text in all the Tibetan Buddhist tradition’s lineages and often praised by His Holiness the Dalai Lama as a peerless text on the cultivation of compassion. The Western psychological perspective will be examined through readings on theories of emotion, motivation, and pro-social behavior. The work of the academic study of Buddhism by contemporary scholars has offered tremendous insights into the historical and social conditions that grounded, informed, and influenced the formation of Buddhist ideas and institutions. More recently, thinking about the normative implications of these insights for modern Buddhist communities has emerged as the growth of Buddhist “theological” thinking paralleling the kind of theological thinking our monotheistic counterparts have engaged in to address similar issues in their own traditions. Buddhist scholars who are also practitioners have moved beyond simply describing the tradition from a critical distance, and begun to use the critical skills of the academy to think about the tradition and speak from within the tradition about issues of concern to themselves as members of Buddhist communities. What do Buddhists have to say about the various social and environmental crises we face, long after the Buddha taught? How ought Buddhists think about the tradition’s patriarchal and gendered pasts, for instance? What are the appropriate and effective Buddhist ways of thinking about these and other problems and questions? This course will examine the development of this branch of Buddhist thinking including the very use of the term “theology” for a tradition without a theos (God), its theoretical grounding, and examples of its contemporary application. The course will offer understanding of Family Systems and Internal Family Systems theories, and engage participants in applying theory to their own experiences, including the interpersonal dynamics of the group setting. Attention will also be given to how these theories and related interpersonal skills may positively impact one’s leadership or ministry within a spiritual or service community. Students should have had at least one previous course in which they participated in a classroom group with emotional vulnerability, and in which they began to consider secular frameworks for understanding mind, emotion, and relationships in light of Buddhist practice and worldview. The Buddhist community has always consisted of monks, nuns, laymen, and laywomen, in that order. The question of women’s place and standing within Buddhism has, throughout, remained a problematic, contentious, and sometimes confusing one, as the historical Buddhist traditions seem to offer simultaneously liberative and oppressive perspectives on women. During this course, we will investigate the complex, and changing, status of women in relationship to Buddhist doctrine and practice. We will approach our study through the lens of examining some of the social constructs of Buddha’s time into today, as well as through the lens of examining the position that the tradition takes in relationship to the question of the inherent capacity of women, and offer some ideas for an interpretive framework to come to understand how to relate to this. We will end by looking at some examples of exemplary Buddhist women practitioners, in the past and in contemporary times. This course will use contemplative pedagogy as well as traditional pedagogical methods for learning. Introduction to alphabet, grammar, and sentence structure of Classical Tibetan language. Students gain first exposure to dictionary use and online resources for Tibetan studies. Students read and translate Tibetan texts and their commentaries in their original language.